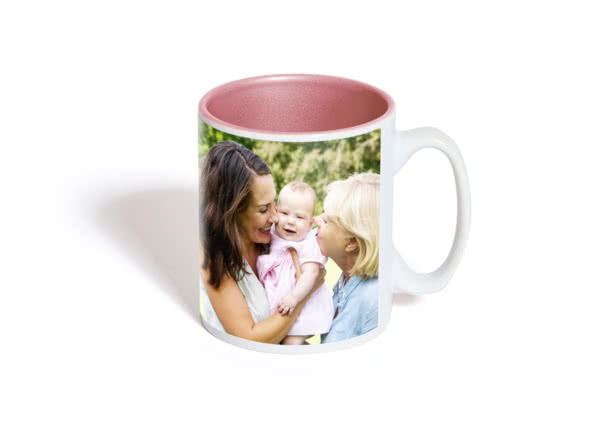 Your little darlings on a Mug and the perfect cup of coffee – that should help the sleepy heads in your house get out of the right side of bed in the morning. Give them a love-themed mug with heart-shaped handle – it’ll really get your feelings across. 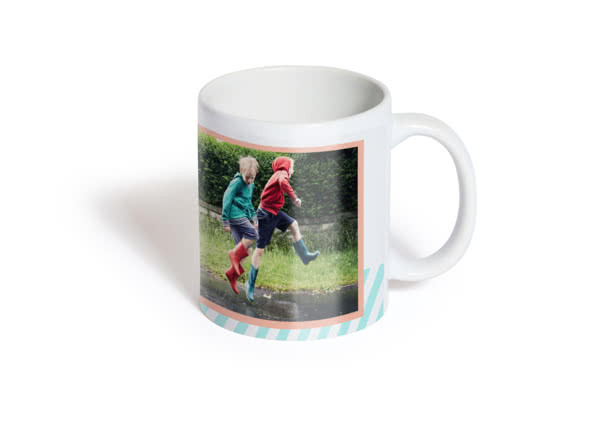 Fill up your mug with a hot drink and watch as your picture magically appears. Then add your favourite snaps. You can upload them from anywhere you like - straight from your phone, computer or social media. You can add text, so why not give your mug a message? A thank you, a little hello - say it on personalised mugs. In just a few steps you’ll whiz through our secure, hassle-free checkout. With a choice of delivery options available, your Mug can be with you in no time. Your photos are embedded into the ceramic or porcelain through a process known as ‘sublimation’ that uses heat and special top-quality inks. 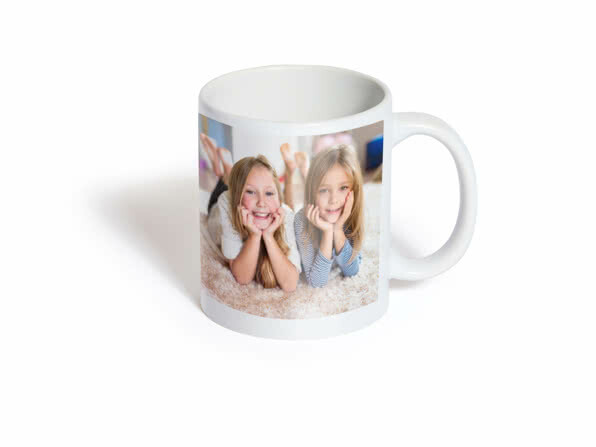 Imagine a big oven – your photos are essentially ‘baked’ into your mug so they won’t come off. Can I add text on my mug? Yes! You can add text to all Mugs. Some of our themes don’t support a caption, so simply pick one that does. It’s a special technique called heat reveal technology. Let’s just say it’s the heat of your drink that makes your picture appear. Are your Mugs dishwasher and microwave safe? Our ceramic and porcelain mugs are both dishwasher and microwave safe, except for the gold and silver Colour Bright Mugs. Our Magic Mug is microwave safe but needs to be hand washed. As for our Enamel Mug, it’s hand-wash only and not safe for microwave or dishwasher use. How many pictures can I put on my mug? Only one photo for our Simple Mug and Simple Porcelain Mug. For all other Mugs, it’s up to 18 photos! How much tea or coffee can the mug hold? Our mugs hold up to 285 ml – enough for a really satisfying cuppa. The photo printing pros. 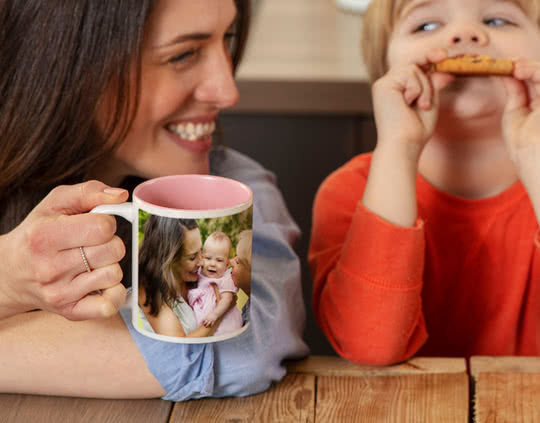 We’ll help you turn your favourite pics into thoughtful personalised gifts – whether it’s a photo of you two on a Love Mug for Valentine’s Day or a graduation picture so Nan can feel proud with every cuppa. Say it with words (and that funny picture of the Labradoodle in your life).